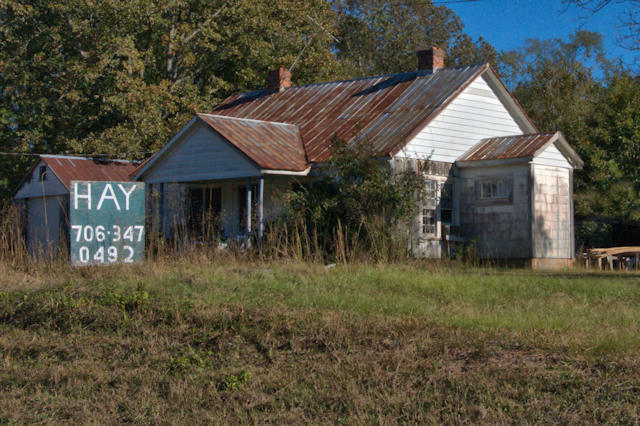 This iconic general store was most likely built in the 19th century, probably soon after the Civil War; it could be antebellum but I haven’t learned enough about the area to make that connection. It features handmade bricks and an architecture rarely seen today. Though its roof is in ruins, the frame of the structure still seems salvageable. 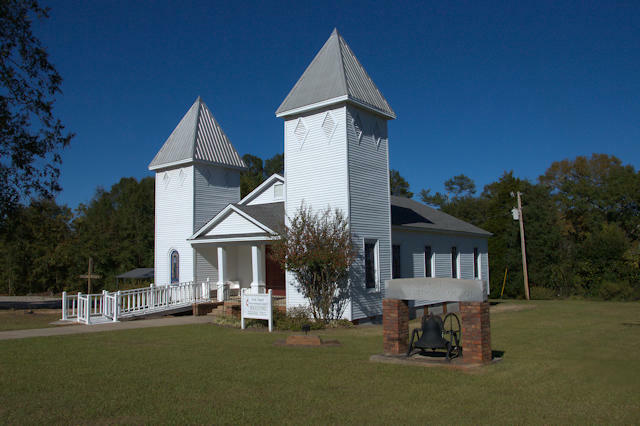 Organized by the Crawford and Wingfield families at the end of the Civil War, Fork (originally Forks) Chapel derives its name from its location between two rivers, the Apalachee and the Oconee. The first church was built soon after organization and was replaced by the present structure in 1915. Though it’s been closed for a few years now, the Greshamville Mall is still a landmark for travelers in the area. 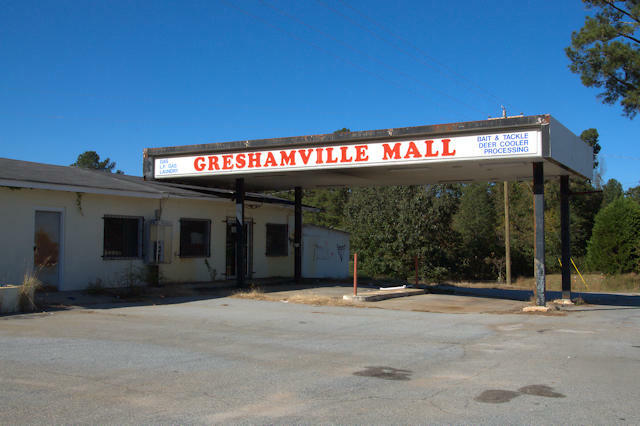 While the name was a bit tongue-in-cheek, it was the closest thing the tiny hamlet of Greshamville had to a one-stop shopping center. It was built by the late Pete Yearwood, a World War II veteran who ran a dairy, had chicken houses and sold real estate. He sold the business in the mid-1980s. 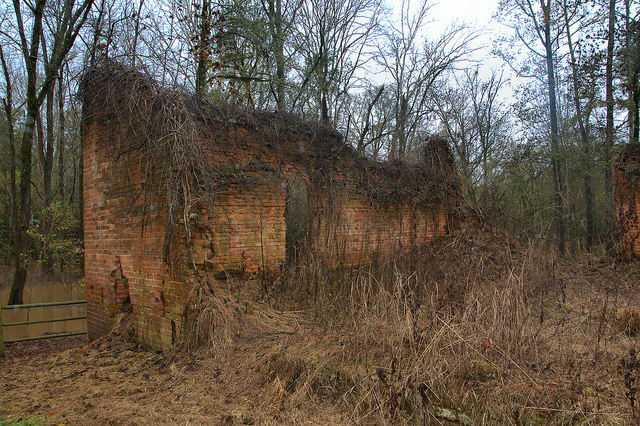 The crumbling ruins of the warehouse and company store are the most significant remains of the once-thriving mill town of Scull Shoals, on the Oconee River in Greene County. 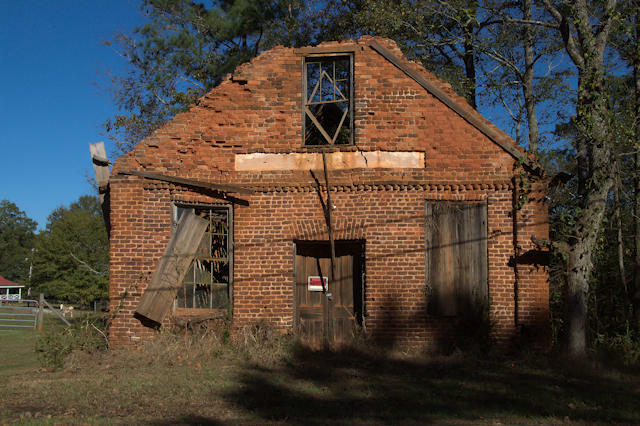 Built in 1846, this structure survived floods and the nearby movement of Union troops in the Civil War only to fall into disrepair after the abandonment of the village and ensuing floods. Scull Shoals village began as a frontier settlement in 1782, and in 1793, after several Indian raids, residents erected Fort Clark. This was built by Michael Cupp, to the Governor’s specifications. It served to protect the settlers from raids across the river by the Creek Indians to the west. 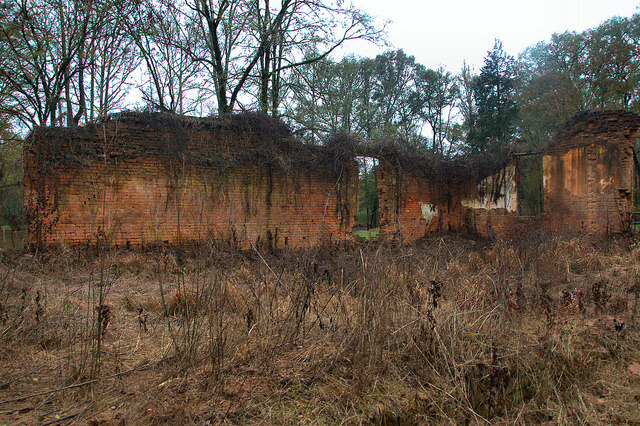 Fort Clark was manned by a local militia called “Phinizey’s Dragoons” until the Creeks were moved west towards the Ocmulgee River by the Treaties of 1802 and 1805. 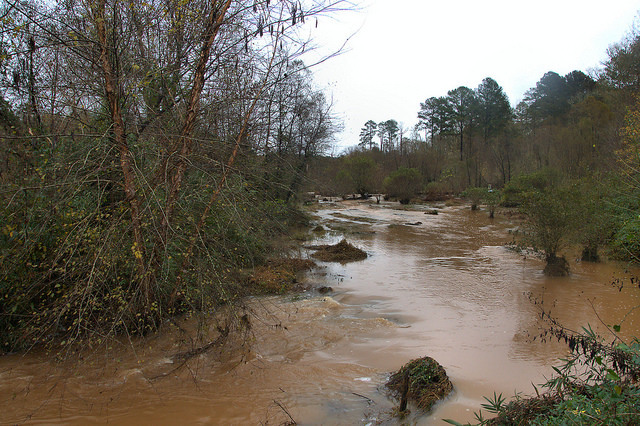 The settlers began to expand rapidly across the Oconee River after the treaty of 1802. White settlers and black slaves quickly opened up the land. Following Eli Whitney’s 1793 invention of the cotton gin, they began to raise cotton in huge quantities. 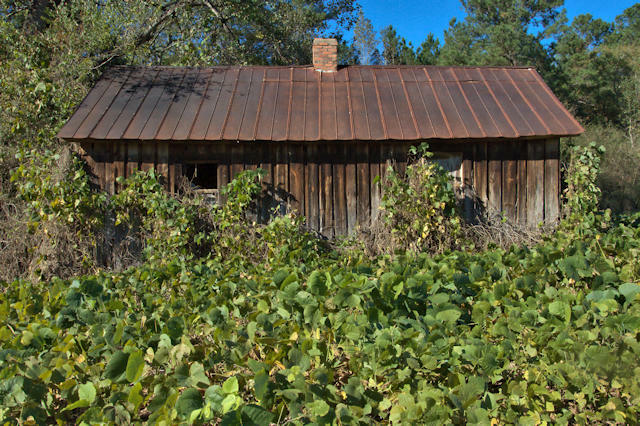 The local villagers began with a gristmill and sawmill, and soon had a cotton gin. 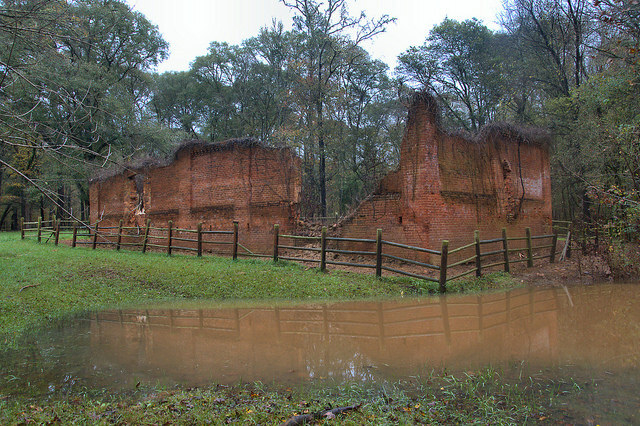 With funds from the Georgia legislature, Zachariah Sims and George Paschal built Georgia’s first paper mill at Scull Shoals in 1811. Though details are scarce, it is probable that the original paper mill was an addition to the water-powered grist mill, already in place. The Sims and Paschal plans were to expand that mill dramatically with a $3,000 loan from the Georgia legislature. The paper mill lasted until about 1815. The operators went bankrupt shortly after the War of 1812. The property changed hands, but the village continued to expand. Under its third owner, Dr. Thomas Poullain,there were flourishing mills, boarding houses, stores, a large warehouse and store combination, a distillery, a toll bridge, and other enterprises. During Poullain’s 41- year leadership (1827-1868), a devastating fire completely destroyed the wooden mill buildings in 1845, as attested in the Southern Banner. Poullain supported his people as they rebuilt the three- and four-story buildings of Fontenoy Mills in brick. They were back in operation by 1846. In 1854 Poullain had 2,000 spindles and looms, consuming 4,000 bales of cotton valued at $200,000. It was clearly an economically productive enterprise. As the enterprise expanded, more than 600 people were employed to make yarns and cloth. Always a company town, Scull Shoals suffered economic problems after the Civil War, and changed hands several times. For a short period (1877-78) it was home to Georgia’s infamous Penitentiary Company #3, which operated the cotton fields and mills with convict labor. It soon passed to other ownership. Dr. Lindsey Durham lived across the river in what became first Clarke, then Oconee County. He was an early Scull Shoals community leader and medical specialist, trained in early life by the Indian curers. He attended medical School in Philadelphia, and then returned to Georgia to practice. Dr. Durham had a 13-acre herb garden and developed patent medicines that he and his medical family used to treat their patients. 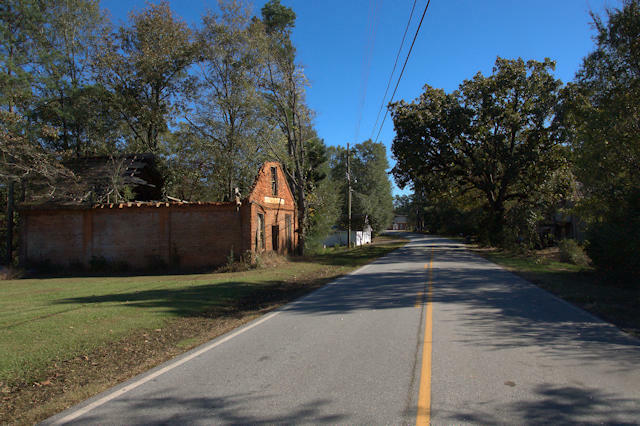 Durham’s 600-bed hospital was in cabins scattered around his home, near present GA Highway 15. It was a major facility for the time. His family became a dominant medical dynasty extending to the present. Scull Shoals village was home to Georgia Governor Peter Early, who served in office from 1813 to 1815. Early was born nearby, and was buried there for a while. He died 1817 at the age of 45. From mid-century on, there were droughts and devastating floods. These resulted in work stoppages, caused by either the lack of water for power, or too much water. The 1887 major flood left water standing for four days in the buildings. The covered toll bridge floated downstream. Several hundred bales of cotton were in the mill, and 600 bushels of wheat in the warehouse. They were all were ruined, bringing economic chaos to Scull Shoals Mills, from which it never recovered. A hundred years of open-field cotton farming caused erosion that removed 8-9 inches of topsoil from the fields. It was deposited in the rivers and covered the shoals. 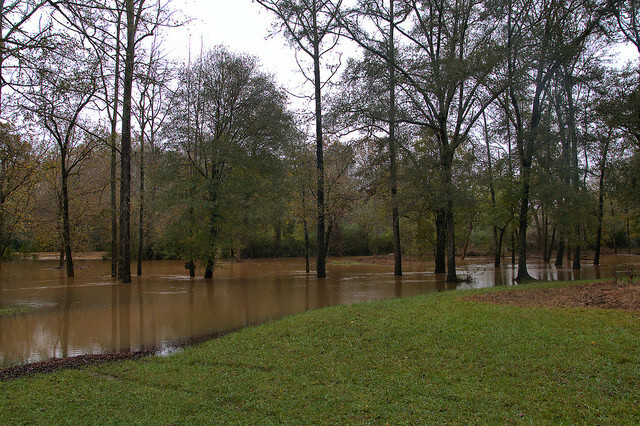 This in turn caused more frequent flooding, which continues to the present. Heavy siltation cut the “head” of water needed to power the mills, often stopping mill work. By 1900, most people had left for regular work elsewhere, and the mills closed for good. During the World Wars, machinery was scrapped for the war efforts, and most of the brick buildings were dismantled and salvaged. Today, only three walls of the brick warehouse and store remain, along with the arched brick bridge that took workers across the raceway into the mills. 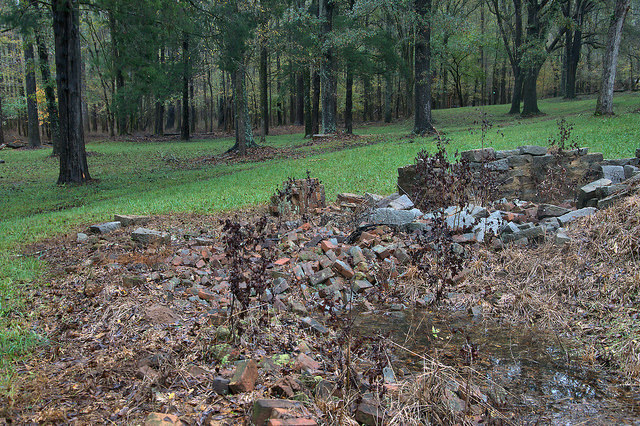 Stone foundations of the old mill’s power plant and scattered stone and brick chimney bases can be found in the downtown village and out in the surrounding woods. Remains of the wooden covered toll bridge stand in the Oconee River. Between 1875 and 1930, the town’s land was divided and sold several times. In the 1930’s tracts were re-assembled by R. P. Brightwell of Maxey’s, and sold to the government for an experimental forest. It became a teaching laboratory for the University of Georgia’s School of Forestry. The Soil Conservation Service and Civilian Conservation Corps also did massive reclamations, by terracing eroded hillsides and replanting the forests. Scull Shoals became part of the newly-created Oconee National Forest in 1959. The old mill town has laid quietly waiting, marked only by the ruins in the woods. During the 1960’s funds became available for landscaping the area to make it more park-like. It was a small picnic area popular for fishing and hunting, and generally forgotten by most everyone. In the early 1970’s, portions of the old roadways into the site were closed. The old roads had become eight-foot deep gullies in places. New roads were built in new locations, and crossing Sandy Creek with a new bridge. 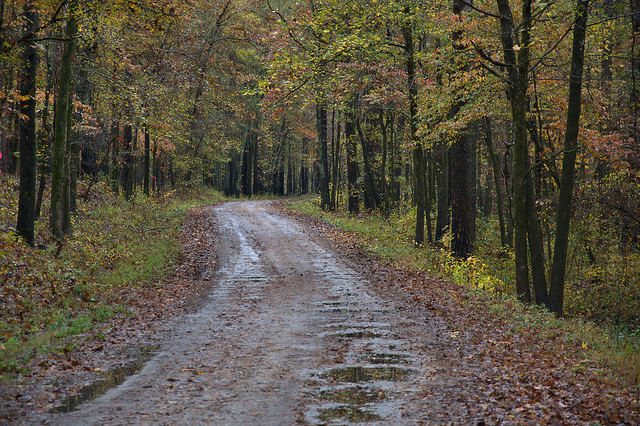 Old roadways can still be found approaching the Scull Shoals Historic Recreation Area. They are easily seen along Forest road 1234, as one enters the forest from Macedonia Church Road. 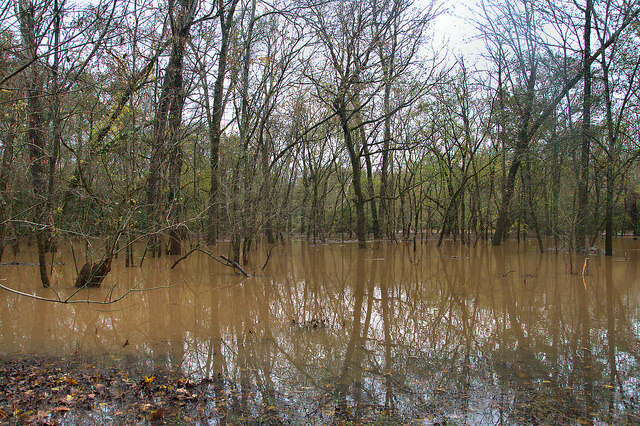 As is often the case in rainy periods, the shoals area was flooded when I was here. It had been raining in the area for well over a week at this time. I was unable to see the old arched bridge or the stone pilings of the toll bridge. I did encounter a couple of men using metal detectors around the foundation ruins. I don’t think they were authorized to be here, but I don’t know the regulations on the property. Unfortunately, this sort of activity threatens the historical integrity of the site, which is among the most significant in the state as an early industrial endeavor. Surprisingly, the access road was easily passable, and with a few leaves still clinging to the trees, the colors of fall were still evident. 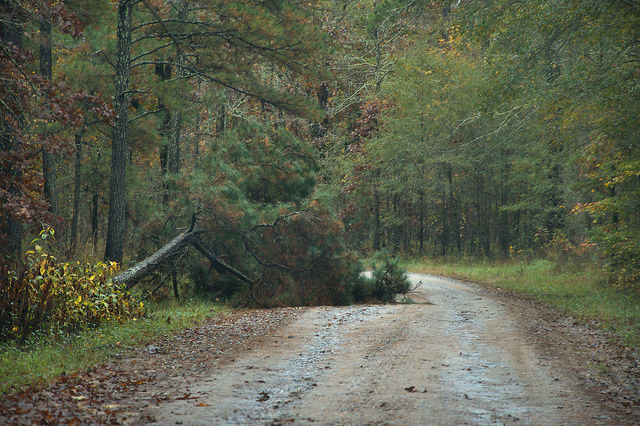 Due to the weather, however, a small pine had fallen into the roadway, a sign to be careful in the area. 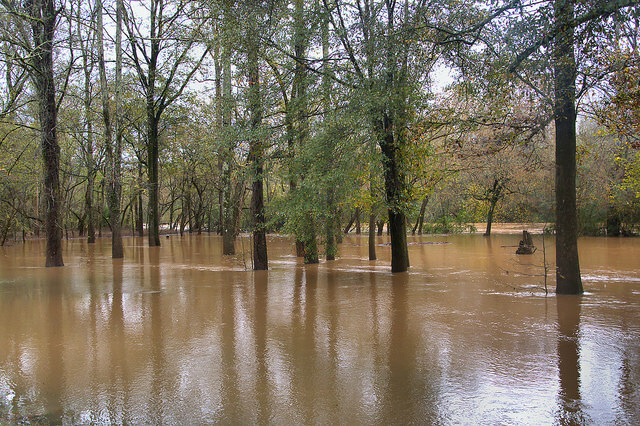 Sandy Creek, which is crossed by the road in to the historic site, was well over its banks, as well. For directions and specifics, visit the Forest Service webpage. Penfield was named for Savannah silversmith Josiah Penfield, who in 1829 bequeathed $2500 to the Georgia Baptist Convention for the advancement of education. Mercer University was established here in 1833 as the Mercer Institute, named for the Reverend Jesse Mercer. The chapel was designed by David Demarest, who was also responsible for the Greene County Courthouse. After the Civil War, Mercer University relocated to Macon and the chapel was given to the congregation of Penfield Baptist Church. Their original home had been destroyed by a tornado. 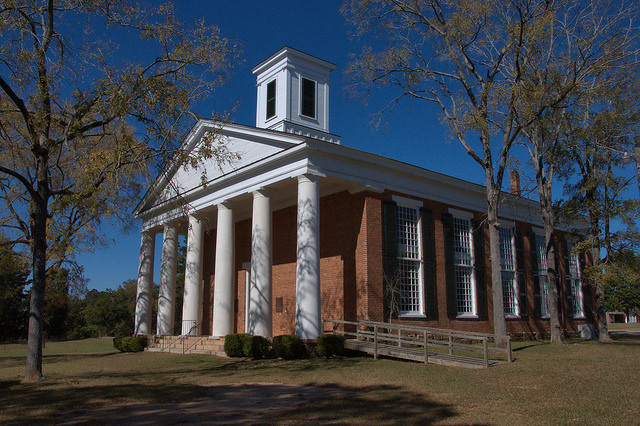 Today, Old Mercer Chapel is among the most revered churches among Georgia’s Baptists and is one of the best Greek Revival churches in the state.